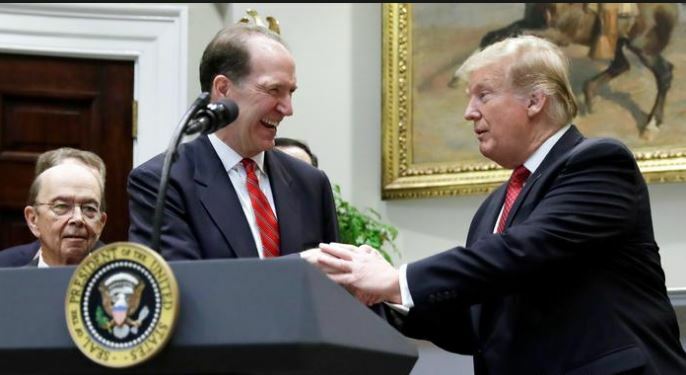 David Malpass, a top U.S. Treasury official in Trump administration, was on April 5 unanimously selected as the new President of the World Bank. Mr. Malpass was a senior economic adviser to the U.S. President during his 2016 election campaign. Mr. Malpass, who has been a longtime critic of global financial institutions, was nominated in February. No other countries had proposed any candidates to challenge Mr. Malpass, making his selection by the board all but assured. As Under Secretary, Mr. Malpass represented the U.S. in international settings, including the G-7 and G-20 Deputy Finance Ministerial, World Bank-IMF Spring and Annual Meetings, and meetings of the Financial Stability Board, the Organisation for Economic Cooperation and Development, and the Overseas Private Investment Corporation. Mr. Malpass has served on the boards of the Council of the Americas, Economic Club of New York, and the National Committee on U.S.—China Relations.